I love the fall especially once all the harvested squash is waiting for me at the local farmers market. I was watching my niece and nephew the other day, and I made these simple, yet delicious Roasted Acorn Squash. I made them in between all of the fetching and toting kids between after school events. I was a little nervous about serving them squash since they are teenagers. Lets face it teenagers can be a fickle bunch especially when it comes to food. I’m happy to say that the Roasted Acorn Squash went over so well that they asked how to make it! I’m now terrified about the havoc that will ensue in their mother’s kitchen as they try to cook. Wash the acorn squash and then cut them in half-length wise (from stem to bottom point). 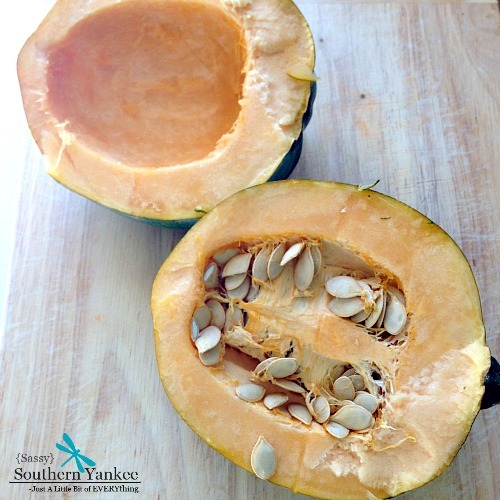 Remove the seeds from the squash and discard (you can plant the seeds and re-grow your own squash In the spring). Place the squash in a casserole pan with the hollowed part facing up (we are going to fill it with yummy goodness). Pour a few cups of water into the pan to help create a steam bath. Next we will fill each of the squashes with the 1 Tablespoon of butter in the cavity where we removed the seeds then sprinkle with cinnamon. Cover the pan with foil and bake in the oven for 30 min until fork tender. 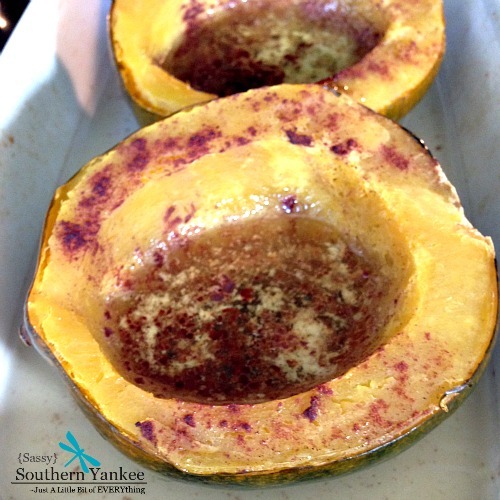 Remove the foil and add 1 Tablespoon of maple syrup or brown sugar to each of the squash and bake for an additional 10 min until the squash has slightly browned. * If you are looking for a quick version of this recipe you can make them in the microwave. Place the cut squash in a microwave safe casserole and add water to the casserole dish. Cover with plastic wrap and microwave on high for 10 min until the squash is fork tender. Remove the plastic wrap and add the maple syrup or brown sugar. Remove the squash from the oven or microwave and you can serve them directly in the squash shell or you can scoop them out of the shells and serve using a serving bowl. We aren’t fancy in my house so we eat them directly out of the shells. 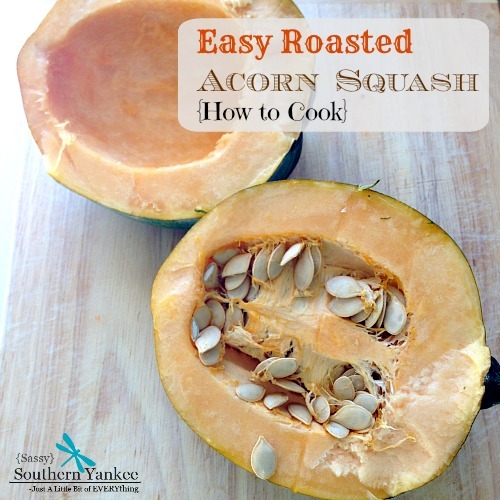 This recipe shows you the easiest way on how to cook an acorn squash. Simple, yet delicious Roasted Acorn Squash are the perfect side to any family meal. Remove the squash from the oven or microwave and you can serve them directly in the squash shell or you can scoop them out of the shells and serve using a serving bowl. We aren't fancy in my house so we eat them directly out of the shells. This entry was posted in Side Dish and tagged Acorn, Acorn Squash, Easy Holiday Sides, Easy Sides, Gluten Free, Healthy, Healthy Sides, holiday, how to cook, How to cook a squash, Maple Syrup, Squash.